Low wages and a lack of available jobs are plaguing the EUs young and educated. Greece’s 15-24 year olds are facing unprecedented levels of unemployment, while Portugal is witnessing a mass exodus as endemic joblessness drives its youth abroad. The UN labor office predicts a global rise in unemployment of 12.8 percent by 2018. Across the wealthier regions surveyed on current youth unemployment levels – including the European Union – the rate stood at a 10-year high of 18.1 percent in 2012, and is expected to remain above 17 percent until at least 2016. Only six countries (Austria, Germany, Japan, the Netherlands, Norway and Switzerland) had youth unemployment rates below 10 percent. Greece is not one of them. 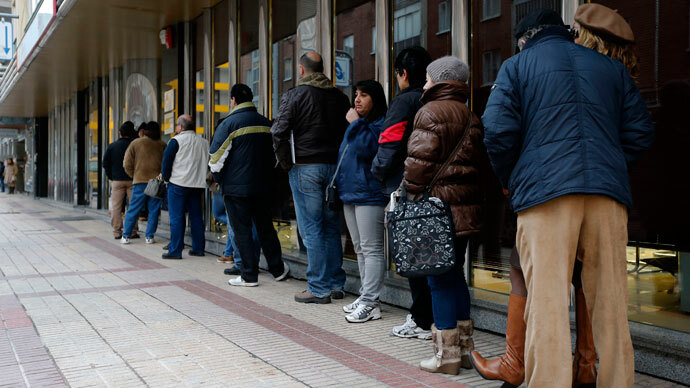 Greek unemployment is twice as high as the eurozone average, with 64.2 percent of young people out of a job in February, according to new data published on Thursday. The country is in its sixth year of recession, drained by tax hikes and spending cuts demanded by the EU. In order to attempt to curb this practice, Greece has slashed the monthly minimum wage for under-25s to 500 euro – a full 32 percent. 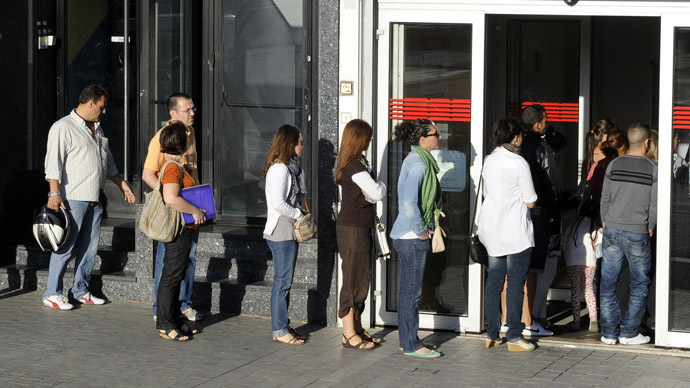 Overall EU unemployment hit a new record in March, according to the most recent Eurostat monthly report. Over 19 million jobless – including one out of four under-25-year-olds – were out of work that month. 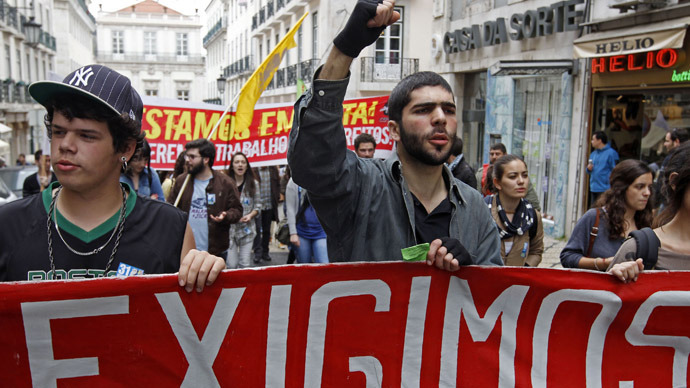 Portugal’s unemployment rate is particularly bad, having soared to 18 percent, according to first-quarter figures from the national statistics institute; 43 percent of Portuguese youth are unemployed. A number of young people and professionals alike are now seeking work outside the country's borders. “It’s not wanting to work outside Portugal; it’s needing to work outside Portugal,” Victor, a Portuguese journalist, told RT. He is set to move to Angola to work for a magazine. One resident named Ricardo is one of the few who has been working – as a website designer to provide online help to the people who want to make the move abroad. He is set to move away himself before the end of the year. “We are facing a serious brain drain in Portugal. Our country educates people but it can’t employ people,” he said, explaining his current job. “I saw lots of people decide that they would move to somewhere like Brazil, only for it not to work out,” he added, explaining how many had fallen subject to scams. “We don’t want to be rich, we aren’t moving for the money. We are moving so that one day we can earn enough to start a family, live normal lives. Here, now, if you can get a job, it’s on slave wages for perhaps three years – that’s not living,” Ines, who has plans to move to Brazil with her partner, told RT. Portugal has been in recession for around three years, and expects more jobs to be repeatedly cut as austerity measures continue. The economy is predicted to shrink by a further 2.3 percent this year. In April, the country's constitutional court implemented €5.8 billion in cuts to, among other things, civil service pay and sick leave benefits. “My pension gets cut time and time again. Soon I’ll get nothing,” said one elderly resident. As unemployment has continued to increase and austerity sweeps Europe, faith in the eurozone is falling sharply among more than just businesses and investors. Massive protests are ongoing in the EU, the most recent being the demonstrations of Spanish students and teachers in Madrid, and budget workers in Athens. without the prospect of creating new ones.